Scores 25 Highway MPG and 17 City MPG! This Kia Stinger delivers a Twin Turbo Premium Unleaded V-6 3.3 L/204 engine powering this Automatic transmission. Window Grid Antenna, Wheels: 19" x 8J Front & 19" x 8.5J Rear Alloy, Valet Function. 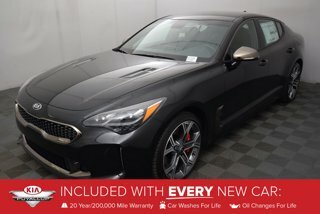 *This Kia Stinger Comes Equipped with These Options *UVO eServices Emergency Sos, Trip computer, Transmission: Electronically Controlled 8-Spd Auto -inc: drive mode select and paddle shifters, Tracker System, Tires: P225/40R19 Fr & P255/35R19 Rr Summer, Tire Specific Low Tire Pressure Warning, Systems Monitor, Strut Front Suspension w/Coil Springs, Sport Heated Leather/Metal-Look Steering Wheel, Speed Sensitive Variable Intermittent Wipers. * Stop By Today *A short visit to Kia of Puyallup located at 111 Valley Ave NE, Puyallup, WA 98372 can get you a dependable Stinger today!